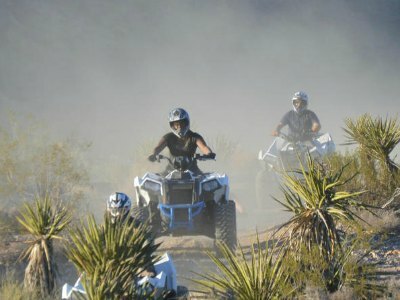 Try Las Vegas ATV tours for extra adrenaline & excitement! Be prepared to feel the wind, take in the sights and get dusty, dirty, and very happy! There are plenty of trails, dunes desert and areas around Las Vegas - in the desert, Hidden Valley, Nellis Dunes, Lake Mead or Valley of Fire. There are all-terrain vehicle rides for beginners as well as for experienced adrenaline junkies, and anywhere in between! You always dreamed of taking your own ATV to a desert climate to experience the rush of adrenaline that pours through body as you maneuver your ATV around natural obstacles. 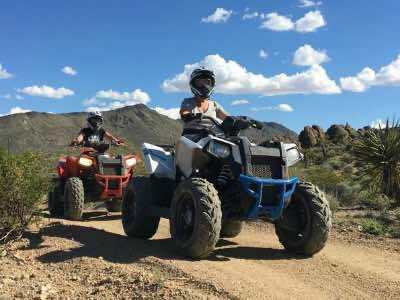 Extreme Las Vegas ATV tours in Hidden Valley and Primm will satisfy your need for adventure that is lacking from your life. You will first take a short van ride to Jean, Nevada where you will be outfitted with equipment for your journey. After a quick safety program, you will set out for some of the world’s best natural scenery to be had. This tour is not for the beginner and requires prior ATV experience. You will travel between 20 and 50-miles of your ATV journey and visit such notable natural terrain such as Hidden Valley, the McCullough Mountain Range and of course the Mojave Desert. This tour is offered in the morning and afternoon with the early tour offering a stop at Primm, Neveada. It should be noted that a $10 per patron fuel surcharge is payable at time of arrival. See the Mojave Desert and impressive mountains up close and personal as you drive an ATV through some of the most beautiful desert scenery you will ever see. 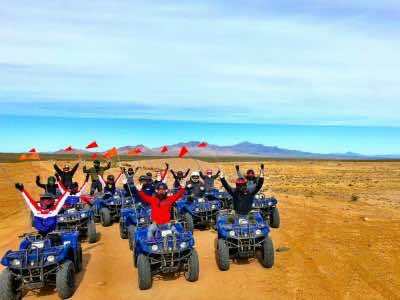 These exciting Las Vegas ATV tours cover from 20 to 50 miles of travel depending on the experience of the riders in your group. You will arrive in Jean, Nevada where you will adorn a helmet, gloves and safety googles. Then after attending a short safety training course you will engage in a two-hour cruise through the natural beauty of the Mojave Desert complete with terrain that will excite all of your senses. Enjoy complimentary bottled water as you travel through the McCullough Mountain Range, the majestic Hidden Valley and the natural features of the Mojave Desert. Your tour includes hotel pick up and drop off service and you must wear closed toe shoes as well as appropriate clothing for desert and mountain travel. In addition all quad bike riders must be 16-years of age or older. The Mojave Desert is uniquely situated to enjoy by taking an adventure on an ATV that will leave you with lasting memories of the Southern Nevada environment. 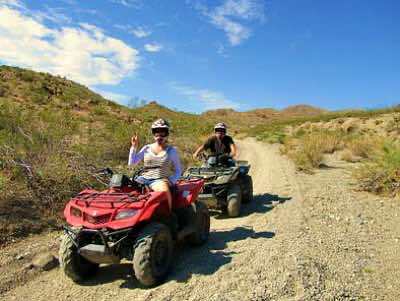 Your Las Vegas ATV tours in Hidden Valley start with pick off and ends with drop off at your hotel. You will take a short ride to Jean, Nevada where you will view a brief seminar on safety. After which, you will gear up with a helmet, gloves, goggles and fresh water for your two-hour cruise through the majestic landscape of the Mojave Desert, rugged area of the McCullough Mountain Range, and Hidden Valley. Your expert guides will give detailed information of the area as you are riding through this one-of-a-kind natural area. On this 4-hour tour, guests are encouraged to wear clothing that is protective from the elements as well as closed toe shoes or boots. All participants must be at least 16-years of age to operate an all-terrain vehicle under Nevada law. Review: Valley of Fire, with it's red sand and rocks and picturesque landscape is another great place to ride an ATV! 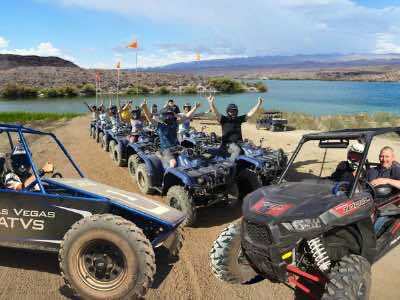 This Las Vegas ATV tour suits both beginners and experienced riders. Your tour guides will provide you with all the safety ATV operation instructions, then show you the most exciting trails while you enjoy the sights as well as the ride. Review: You don't need to be experienced to ride the trails of the Eldorado Canyon, along the Colorado River! 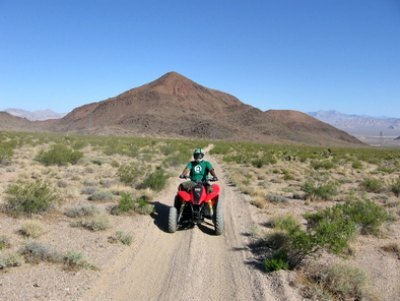 These Las Vegas ATV tours are designed for beginners and for experienced ATV riders. However, do not expect an easy ride - the mountain terrain is pretty tough and bumpy at places - you will love it! This tour also includes a walking tour into the abandoned Gold Mine called Techatticup Mine that is now believed to be haunted. Listen to the story of lawlessness that was going on at the mine during the Great Gold Rush. You will also be amazed by the "bLast from the past" during your stop at the abandoned Old West Town for lunch. Enjoy the highlights of the Hoover Dam and Lake Mead National Recreational Area on the only Las Vegas ATV tours offered for this majestic area. Your tour starts and ends with hotel pick up and drop off. Travel to the Hoover Dam where you will marvel at one of man’s greatest engineering feats, which created Lake Mead the largest man-made body of water in the Western Hemisphere. From the Hoover Dam you will navigate your ATV to Arizona Last Stop and continue down trails that lead you to the mighty Colorado River. Feel the power of the river while taking up close and personal photographs of this world class scenery. This five-hour tour will leave memories etched in your mind forever as your expert tour guide explains the cultural and natural history of this pristine area. All participants must be 16 years of age or older and wear closed toe shoes. There is additional $10 fuel surcharge per person due at the time of arrival at Hoover Dam. Don't leave Vegas without experiencing the allure of the Mojave Desert! 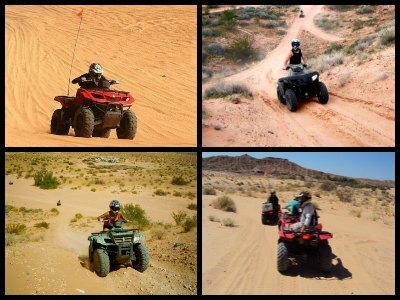 If you have limited time, this half day Las Vegas ATV trip offers a short adrenaline rush and a chance to explore the desert landscapes away from the glitz and the glam. The tour collects you and your group at your Strip Hotel and as you shuttle to the trail, your professional guide will give you some insight into the fascinating history of Vegas and the iconic characters that made it famous. When you arrive, you will be given a quick ATV driving lesson and safety briefing. Get geared up and climb aboard! Follow your guide along the trails, kicking up dust, bouncing over rocky outcrops, rushing down into the valleys and back up again. It is fabulous fun and will make unforgettable memories. The trip is a small-group tour for a maximum of 14 people. After your one and a half hour Las Vegas ATV tour, you will certainly have worked up an appetite. Head for the restaurant and bar where lunch and refreshments will be waiting. Share your experience with your friends as you munch on a great American burger with fries washed down with an ice-cold soda.